Self-cleaning ovens work by heating up to about 900 degrees Fahrenheit. At this temperature, any food particles or spills left in the oven get so hot that they turn to ash, which you can easily wipe away with a damp cloth. Food residue is not, however, the only material that reacts to such high temperatures. If someone opens the oven door during a cleaning cycle, the heat could burn them or damage the walls and any cupboards that are close to the appliance. To keep everyone safe, self-cleaning oven doors feature a latch that locks the oven and makes opening it during a cleaning cycle impossible. If this latch misfires and locks you out of the oven when it shouldn't, try turning the oven off or resetting it at the fuse box. If those tricks don't work, it's time for a service. If your oven is still locked after running a cleaning cycle, you may just need to wait longer. 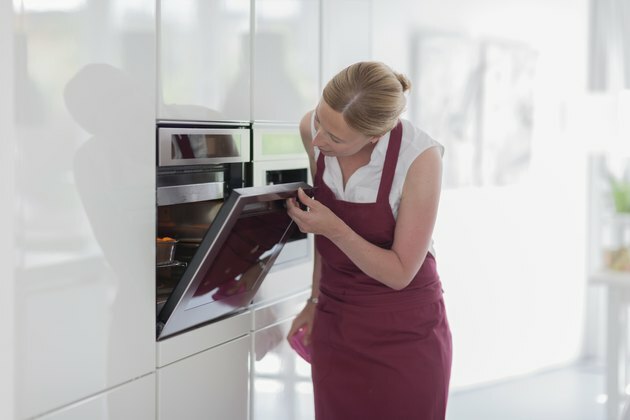 Self-cleaning ovens don't unlock as soon as the cleaning cycle ends. The oven will stay locked until its internal temperature drops to about 200 degrees Fahrenheit. This can take several hours because oven manufacturers design their products to hold as much heat as possible. The better the insulation and seal on your oven, the longer it takes to cool down after a cleaning. You may find your oven has arbitrarily locked itself when you weren't even using it. If you try to use your oven and find it locked, press the "clear" or "reset" button to stop the oven and turn it off. Wait a minute or two and then try to open it again. If it's still locked, start an oven cleaning cycle. Allow the cleaning cycle to run for about 60 seconds and then cancel it. The oven should unlock. If you're still not having any luck, run the shortest cleaning cycle you can on your oven. Sometimes the cleaning process will take over and unlock your oven as it should when cleaning is complete. If you don't have time for a cleaning, turn the electricity to your oven off at the circuit breaker for a minute or two to reset the appliance. If you still can't get in, call a repairman. Things get a little more frustrating if a locked oven door is coming between you and your dinner. If your oven locks with food in it, try turning the oven off. Press the "clear" or "cancel" button if you have an electronic oven. If your oven is manual, turn all the dials and knobs to their "off" position. If that fails, turn off the circuit breaker that supplies power to your oven for a few minutes, then turn it back on. If resetting the oven at the circuit breaker doesn't work, order a pizza or go out for dinner and call a repairman in the morning. Try opening the oven one last time before you make the call, though. Sometimes the oven will unlock itself once it has cooled down. Never start the oven's cleaning cycle if there is food, utensils or anything else inside the oven.